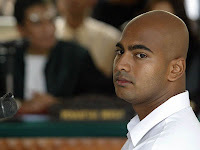 Death Penalty in Indonesia (2) | Pan Mohamad Faiz, S.H., M.C.L., Ph.D.
Posted on May 2, 2007 by Pan Mohamad Faiz, S.H., M.C.L., Ph.D.
Capital punishment debate resurfaces when a group of death row inmates lodged a judicial review to the Constitutional Court against death penalty articles under the 1997 Narcotics Law, used by the criminal court to sentence them. Almost 130 countries in the world had abolished capital punishment while the rest including Indonesia still preserves it. The petitioners argue that death penalty is a denial on the right of life as guaranteed by Articles 28A and 28I of 1945 Constitution. According to international human rights instruments such as the International Covenant on Civil and Political Rights (ICCPR), the right to life is a “non-derogable right”. Indonesia is a party to the ICCPR but has not acceded to its protocols. Petitioner’s lawyers argued that as the verses on the Constitution almost verbatimly mimic the ICCPR’s wordings, they have to be interpreted pararell to the ICCPR. ICCPR does not prohibit death penalty but its protocols do. As Indonesia is not a party to any ICCPR’s protocol the practice of death penalty will not violate any international obligation to the ICCPR as long as the treatment of the inmates in the death row and the execution of the convict is made in accordance with international standards. It is then left to the problem of constitutional interpretation. Article 28I (1) of the constitution guarantees stated that the right to life cannot be limited under any circumstances, but Article 28J (2) stated that “In exercising his/her rights and freedoms, every person shall have the duty to accept the restrictions established by law … based upon the consideration of morality, religious values, security and public order in democratic society”. The debate goes on as to whether the application of Article 28I (1) – due to the phrase “cannot be limited under any circumstances” – is non-derogable, including by Article 28J (2). The convict’s attorneys think that the rights under Article 28I (1) belongs to the cluster of rights which are non-derogable, including by Article 28J (2). The government on the other hand, is of the opinion that Article 28J (2) may derogate Article 28I (1). Toward this polemic, there are a few methods of interpretation that can be applied. First, by using the literal approach, it would appear that prohibition of death penalty is stated nowhere on the Constitution. The wordings of “cannot be limited under any circumstances” under Article 28 I (1) cannot therefore be interpreted so as to mean prohibiting death penalty. A comparison towards Germany and Vietnam’s constitutions would reveal that the prohibition of death penalty is supported with a written, literal expression on the articles of the Constitution. As Indonesia’s Constitution has no such provision, death penalty is so far, in line with the Constitution. Second, by using the teleological approach, it can be seen from the preamble that the purpose of the constitution is to first “protect the whole people of Indonesia and the entire homeland of Indonesia”. Indonesia has 3.2 million drug users with the number of death around 15.000 users per year or an average of 41 deaths per day due to the overdose or drug-related AIDS infection. The state has the constitutional obligation to prevent these deaths and to prevent the occurrence of lost generation. Thus, the protection of the people by the state is paramount and would constitute a higher obligation in comparison to other duties. Third, using the systematical method of interpretation, it would be clear that Article 28 J is placed under the same chapter with Article 28 I, which is the amended human rights chapter. It is then conclusive that Article 28 J was made “in relation and with due regard to” Article 28 I. We do not consider it appropriate to interpret that the restriction towards the implementation of human rights under Article 28 J refers to clusters of rights other than Article 28 I. The restriction under Article 28 J appears to cover the whole set of the constitution. Moreover, under the social contract construction, perpetrators are deemed to have waived their right to life which is protected under the law by conducting actions which results in the loss of life of other. Thus, by “knowingly” killing others and having aware that their action entails a capital punishment, they have given “implied consent” to be punished with death penalty. There are also a number of non-legal arguments which supports death penalty, especially when it comes to “most serious crime”. There is no common understanding among UN Countries on this matter. Nonetheless, we can refer to the concluding observation of U.N. Doc. CCPR/C/79/Add. 25, 1993 which stated that the “imposition of [death penalty] … for crimes than do not result in loss of life, as being contrary to the Covenant.” The Advisory Council of Jurist of Asia Pacific Forum considers this crime as those which involve the wanton destruction of human life. In their book, International Criminal Law and Human Rights (2003), Claire de Than and Edwin Shorts defines the scope of “most serious crimes” encompass modern threats such as drug trafficking or terrorism. Narcotics are the kind of crime which may results in the loss of life of others. The debate however continues as narcotic accomplices does not “pull the trigger” themselves. From a consequalist point of view, it may not be relevant that a certain crime is conducted “wilfully and knowingly” which means that there is a direct causal relation between the intention to kill and the consequences resulted by such intention or only “knowingly” which suggest that the intention to kill is not as manifest as the previous condition, as long as it results in the loss of life of others. Thus, killing by producing and organising narcotics is by no means a lesser evil compared to killing a person directly, as the perpetrators are fully aware that their action will result in the loss of life of others. In this grave condition, States are fully responsible to protect its citizen. State has to exercise “action” by introducing a special measure of punishment. Otherwise the states might be guilty for failing to protect the lives of its thousand citizens because of its “omission” and a “failure to act” (Sustain and Vermule, 2005). Comparative study has shown that most of the retentionist countries decided to abolish death penalty after a long crucial public, judiciary and legislative debate. Due to de jure reality of death penalty, what may be done is restricting the offence for which the death penalty is allowed under the law. Quoting the analysis from The Jurist of Asia Pacific Forum, ultimate abolition is possible only when the basic standard in the criminal justice system is already achieved. Mohamad Mova Al Afghani (http://indolawreport.blogspot.com) is the founder of Center for Law Information. Pan Mohamad Faiz (http://panmohamadfaiz.blogspot.com) is the founder of Institute for Indonesian Law and Governance Development. Education is not a product – mark, diploma, job, money – in that order; it is a process a never-ending one. This entry was posted in Const. Law, Death Penalty, Indonesian Law, Judicial Review by Pan Mohamad Faiz, S.H., M.C.L., Ph.D.. Bookmark the permalink. Hi, nice article and you have a good blog too. I don’t really know about law so I guess I’m gonna try harder to understand your articles. Salam. This article is impressive, like all your other articles. Salam kenal to Bung Mova Al’Afghani in Bremen. @ Jennie S. Bev: Thanks sista’. I’ve send your greeting to my collague in Germany. The Yellow Jackets gather here..